It changes to the image in the season when there is a point. A simple mountain village, Tono is the region that is featured in Kunio Yanagida's Tono Monogatari (Legends of Tono). Here, you can enjoy some traditional Japanese scenery, which is not so common these days. 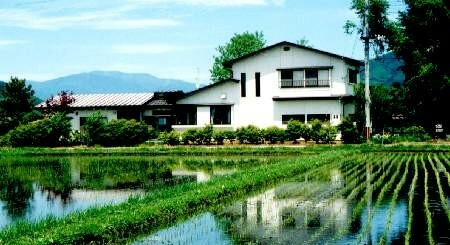 Our youth hostel stands in the middle of the Tono Basin, an area that is surrounded by mountains on all sides. The managers,who was born and bred in the city, opened this youth hostel, out of their love for nature. We value a homelike atmosphere. And strive together to provide if for you. Welcome! Please make yourself at home! ☆Copyright(c)2002 Tono Youth Hostel, All right reserved.